The Adobe House was a typical structure used as a house style that was built by the Pueblo, Zuni and Hopi tribes of the Southwest cultural group who inhabited the desert climates of New Mexico, Arizona, and Texas. The Adobe Houses varied in size, were often terraced and multi-storey with access via a doorway or entry entry through the roof by ladder. Ancient Pueblo houses were made of stone and were later built with sun-dried Adobe bricks made of clay, soil, sand and straw. The original construction material to build these homes was stone and as the style and design of house was used by the Pueblo group of Native Indians their homes were commonly referred to as 'Pueblos''. The term 'Puebloans, derives from a Spanish word meaning "village dwellers". The Spanish introduced glass and the adobe brick and their houses became known as 'Adobes'. Adobe houses have very thick walls and are generally very cool in the summer and warm in the winter. The ancestral Puebloans, called the Anasazi, first lived in Cliff Houses to protect their people from attacks by hostile tribes. The Anasazi cliff dwellers were sedentary farmers who planted crops in the river valleys below their high perched houses. The people were excellent stone masons and soon moved from their cliff dwellings and began to build their houses beneath the overhanging cliffs, near to their farms. Their basic construction material used to build the 'Pueblos' was sandstone that they shaped into small rectangular blocks. The sandstone blocks were fixed with mortar made from a mixture of mud and water. The rooms in the Pueblos measured 8 - 10 feet and the constructions were terraced and multi-storey. Living rooms were at the front of the Pueblos and the rooms at the back and on the upper levels were generally used for storing crops. Underground chambers used for ceremonial and religious purposes, called kivas, were features of all the villages. The stone Pueblos had only small windows which had a sheet of mica instead of glass. Mica was a thin transparent kind of stone, which would let light in, but not the cold or heat. Mica was used by many ancient civilizations including the Mayans and the Aztecs. The Spanish arrived in the 16th century and introduced the ancient Adobe brick building technique that was common in Europe and the Middle East. "Adobe" is the Spanish word meaning "to plaster", derived from the Arabic word "al-tob", dating from the Moorish occupation of Spain. Adobe is the name given to bricks made from a mixture of mud, sand, straw, and sometimes ash. The mixture was poured into 10 x 14 inch moulds to form hard Adobe bricks. The Adobe bricks were dried in the hot sun (not kiln-fired) to make a very strong building material for the Adobe house construction. 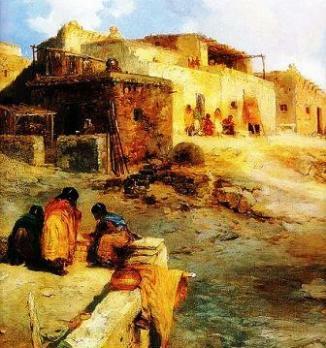 The Adobe, or pueblo villages consisted of multi-story houses that were often built on high table lands that were inaccessible except by steep trails. A feature of every village were the underground chambers used for tribal ceremonies and rituals called Kivas, that were were at the center of their rich spiritual life. Cone-shaped bake ovens (hornos) were dotted around the Adobe villages as were ladders reaching up to the flat roofs. Ramadas, simple structures that were open on at least three sides were also built to offer shade from the blazing hot sun. Many Adobe villages had ball courts for recreation purposes and plazas where people would meet. There were also trash mounds and cemeteries in Adobe villages. Access to water was via large, complex irrigation canals that sometimes measured up to 15 miles in length. How was an Adobe House built? Each family lived in a single room of the Adobe House, but if the number of occupants grew large enough, side-rooms were added. The old Adobe House interior often had internal ladders that led to the roof as well as small doorways and windows. A square space provided access to the roof. In case of an attack, ladders could easily be removed. Benches were attached to the walls providing seating and storage facilities. The Pueblos had little use for other items of furniture. Beds were made up on the floor, sometimes using straw mattresses, and bedding consisted of blankets or sheepskin rugs. Corner 'beehive' fireplaces replaced the original fire pits, with cooking utensils stored nearby. The people developed great skills in basket weaving and pottery making and such items were proudly displayed around the Adobe house. blankets.